It’s finally summer and the evenings are getting warmer. You might be thinking about dusting off the barbeque and having your family and friends round for a party. After all, that’s what summer is all about! Here are our top tips for throwing a wonderfully green garden party. Although it’s nice to receive an invitation in the mail, sending out your invitations digitally is a great first step to your green garden party. Best of all – it’s free! If your guests live locally, add a line or two into the invitation message to let them know you are organizing a green garden party and that you would appreciate them making the effort to use eco-friendly methods of transport such as walking, cycling or public transport. Using plastic disposable cutlery is a wasteful way to run your garden party. Consider using your normal dishes, plates and cutlery instead. If you REALLY don’t want to do the washing up at the end of the evening, then at least try to purchase biodegradable one-use items or ones that are made from recycled materials. 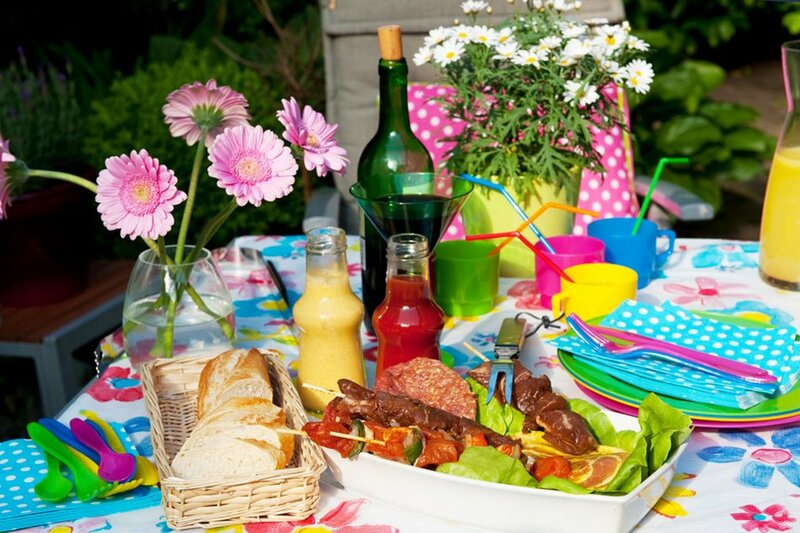 Similarly, cut down on the waste that your garden party creates by using cloth table cover and napkins. Just throw them in the washer the next morning and fold them away ready for your next event. Get your crafty hat on and sew your own bunting from an old quilt cover or clothing rather than purchasing machine-made products. Not only will this save you money but you’ll be bursting with pride every time someone complements the decorations! One-use disposable barbeques rely on charcoal and firelighters to work. They are not recyclable and release lots of fumes into the atmosphere. Many disposable BBQs are not made with sustainable charcoal which contributes to deforestation. There are various types of barbeque fuel available which are eco-friendlier than charcoal. You can help to reduce your carbon imprint by using alternative BBQ fuels such as natural gas and propone – or perhaps by investing in an electric grill. Sometimes, there’s nothing quite like the smoky taste of charcoal at a barbeque. For many BBQ enthusiasts, alternative fuels simply aren’t the same. If that’s the case, try using bamboo charcoal which has a high mineral content that has little impact on the environment when burnt. Green lump coal and coconut shell briquette are other options that are friendlier to the atmosphere than normal charcoal. Keep your carbon footprint to a minimum by purchasing local food and drink. Organically farmed meat and pesticide-free fruit and vegetables will give your food that extra special dose of loveliness. Serving drinks in pitchers can help to reduce your waste as you aren’t relying on individual bottles of drink. You can purchase large pitcher jugs or dispensers for just a few dollars and you’ll be able to use them time-after-time. Here’s a recipe for brown sugar mojitos – mmm! Instead of playing a radio or CD to entertain your guests, why not invite people to bring their musical instruments and serenade you? That way you’ll cut down on your electricity usage and you might even find out the hidden talents of some of your family members and friends! Going for a walk can be a lovely way to spend a couple of hours after your meal. A brisk walk will help your food settle in your stomach and it will allow you to relax after the stress of cooking for everyone! If you have had a BBQ, make sure it’s completely cooled before you leave it unattended. It’s not a garden party without sports! Football, soccer, tennis, badminton, croquet, skittles, cricket – the list is endless! Split your guests up into teams and get that competition started! If you have lots of guests, you could even organize a mini-tournament with a prize for the winning team. Don’t forget though, it’s not all about the winning – it’s the taking part that counts. When your guests are done eating, refrigerate the leftovers so that they don’t spoil. If there is too much for your family to consume over the next couple of days, offer some of the remaining food to your guests to take home. For food and drink that can’t be saved, for example vegetable peelings, put them on your compost heap if you have one. If you don’t, but one of yours guests does, give it all to them to take home instead! Garden parties always end up with lots of recyclable materials. Glass bottle and aluminum cans are the usual suspects. You can make your job easier by putting out labelled buckets near the bin so that your guests put their empties into the correct containers rather than chucking them in the bin for you to have to sort out later. Rather than using harsh chemicals, clean your barbeque the old-fashioned way with some baking soda and a wire brush. This is an effective and eco-friendly way of cleaning the grill and it’s sure to leave it sparkling. Have you got any green garden party advice? Do you have any top tips for a green garden party? Leave your eco-friendly barbeque ideas in the comments below.